One of the simplest ways to add a huge return on your property investment is to landscape. Appearances matter and having a beautiful, vibrant garden can be the difference of thousands of dollars (if done right). Gardening and maintenance doesn’t even need to be a chore, because there are simple steps you could be doing right now that will make a world of difference. To get the most out of your property’s value, draw on our 20 years of experience with some of these tips. This one’s fairly obvious, but needs to be stated before all else. Giving your lawn a neat trim, carefully ordering potted plants to achieve optimal visibility, pruning trees and hedges; these basics are crucial because they make further changes easier. People are much more inclined to buy a property that looks ready to suit their lifestyle. In addition to this, having a neater, uniform garden signals to potential buyers that the maintenance will be easy! Our brains are hardwired to identify (and prefer) patterns and sequences. Use this to your advantage by matching the style of your garden with the architecture of your home. Older style houses will benefit from much more refined and conservative garden arrangements, with the odd splash of colour here and there. If you own a more modern property, you can complement innovative architecture by experimenting with a variety of textures and colour compositions. Creating your own soil conditioner reduces your environmental burden, gives plants an excellent growing environment, and is free! It’s one of the simplest tricks in the book, and is a guaranteed win-win for any homeowner. Organic waste from food scraps and fallen leaves are your raw materials; all that really needs to be done is to create or purchase a compost bin. Introduce this material into the bin, spray it with some water and aerate every week or so. Give it a couple months to develop, and you have your very own organic, natural compost! Composts are great for a garden because they reintroduce nutrients and minerals to the soil will help your plants grow strong. They also contains natural pesticides to keep pests from getting at your prized plants. Mulching requires even less effort. Again, organic materials like leaves can be shredded up into 2 inch bits, which then liberally cover the soil. This helps the soil to retain moisture and heat, and stops weeds from getting the light they need to grow. Dead grass is a clear giveaway of poor lawn maintenance, and is plainly an eyesore. Luckily, you have options that are sure to give you a return on investment. You could firstly revitalise a lawn by introducing lawn seeds to kick-start new growth, or even have a wholesale turf replacement done. Another trick to easily add visual flourish to a lawn is to strategically plant ornamental grass to improve dynamic contrast and texture. Most varieties will work well to sharpen the garden a bit, but have a look around to see what colours compliment your existing yard well. Lastly, consider cordoning off turf with wall edging to add a distinctly modern flavour to your lawn. Introducing stone or wood pavements can be a great way to section off parts of the lawn, and guide a prospective viewer’s attention to parts you may want to show off. It also defines lawn edges and makes navigating a lawn just a bit easier. For example, in-setting stone walkways around the garden can add a cosy, rustic feel to a backyard, whilst sharpening up the overall aesthetic. This is a particularly trendy option for landscaping homeowners across the country right now, but has real practical uses too! Although adding some outdoor fixtures requires a bit more investment, integrating some lovely outdoor fixtures can do wonders for any outdoor space, conjuring up images of luxury and class. 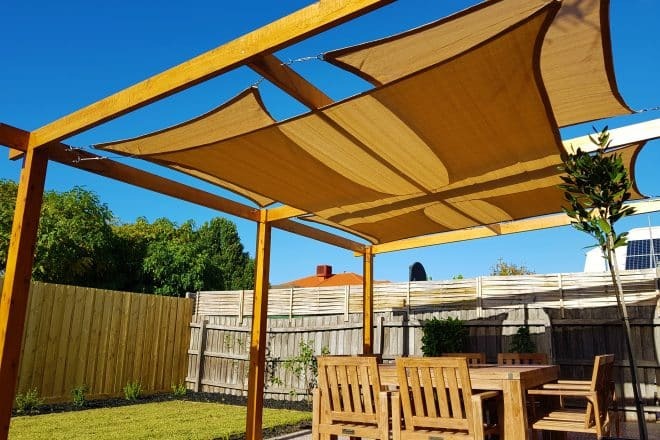 If you have a pool, consider adding a shade sail to set up your backyard for warm summer swims and barbecue sessions. Similarly, water fixtures like fountains add an air of serenity and movement to any yard. Lastly, a pergola can transform a backyard into a comfortable lounge space, perfect as a dining space or for hosting events. All outdoor fixtures will come with specific requirements (such as local council restrictions) and maintenance costs, but any outlay will be easily recouped financially and aesthetically. If you’re unsure with what will work best for your lawn, you can learn more by contacting the experts at Everlast today.